Dominic Ondoro is pretty tall for a Kenyan runner. Maybe 5'11", with shanks like a deer. He broke away from his countryman and training partner Elisha Barno at about the 21st mile to win Sunday’s Twin Cities Marathon, receiving a $10,000 check. He demolished the course record of 2:10.05 that has stood for 31 years (for an additional $25,000) by covering the deceptively taxing course from Minneapolis to St. Paul in 2 hours 8 minutes and 51 seconds. Ondoro, who won last year at Twin Cities in 2:11.16, approached this year’s race with learned respect for the hills that treat tiring runners harshly between miles 20 and 25. Nonetheless, he impressively negative split, covering the fairly flat first half in 1:05.02 and the second half in 1:03.49. Ondoro needed a few minutes to, you know, sit quietly and make sure all the parts were still intact, and then told reporters he understood why the record had stood as long as it had. Ondoro and Barno train with other Kenyan runners in Santa Fe, N.M. They’re professional journeymen, earning their keep by hitting second-tier marathons and road races rather than the major ones, like the Chicago Marathon that took place on the same day. Running, and winning, is their job, but since they can only run four marathons per year at the very most—and usually only two—they have to be very strategic about which races they enter. The winner of the Chicago Marathon gets $100,000, ten times the first-place award at Twin Cities, but Chicago has the budget to attract 2:06 and 2:05 marathoners with appearance fees. A 2:08 guy like Ondoro would probably not warrant appearance money amongst a field of that caliber, and he would have to gamble on having a very very good day to take even Chicago’s last money spot—fifth—of $25,000. A win at Twin Cities was a much safer bet, and arriving at the start line healthy with solid training and perfect weather, the businessman countenanced substantially boosting his take-home by aiming at both the win and the course record. The 1:05 first half was a test of the equipment, just brisk enough to put the course record within reach. At halfway though, a decision had to be made, and the bill paid over the next 13 miles. According to the Star Tribune, Ondoro and Barno discussed, concluded, and took off together just after halfway. The stakes were quite high—we’re talking about a quarter of this guy’s annual income, at least. Though he and Barno had no doubt done some brutal 23-mile training runs, and though both men looked smooth, light, and untroubled, make no mistake—it was not easy. Six minutes off the current world record, a 2:08:51 marathon is nonetheless quite painful. Heck, any marathon that is raced, pushing to hit a certain time or shake an opponent, as opposed to merely finishing, is an entirely different event. All of the top 20 finishers had vividly bloodshot eyes; some will have blood in their urine. Having burned the easy fuel, and then some fat, under extreme duress, the body “goes catabolic,” i.e. it breaks down muscle fibers for the stored glycogen and consumes them. It’s not pleasant. This is what Ondoro and Barno signed up for when they decided to go for the course record, and there was no guarantee the pain would be worth it. They could easily have imploded at 22 miles and gotten nothing but picturesque bodily fluids for the effort. Ondoro ran all the way through the finish, then was rounded up and directed into the media tent, where he sat hunched over on a folding chair, coughing weakly, sipping at water, swishing and spitting some of it on the ground. Someone shoved a microphone at him but he waved it away. Barno was ushered in, and a few minutes later, Kenyan Rodgers Gesabwa. Ondoro looked up briefly, they touched hands, and said something to each other in Swahili. The three spent wraiths coughed softly, drank, spit. Ondoro asked for a tissue to wipe his mouth. After about ten minutes, he spoke quietly into microphones. No one that I saw interviewed Barno, who finished in an impressive 2:10.21—now the third-fastest time ever run on that course—for an $8,000 payday. And a great deal of anonymity. In a cruel demonstration of the vagaries of running marathons for a living, both Ondoro and Barno ran faster than the winning time in Chicago, where Kenyan Abel Kirui earned $100,000 for covering the course in 2:11.23. The two friends, Ondoro and Barno, said they would celebrate theirs as a joint victory. Ondoro wept into his hands during the award ceremony. 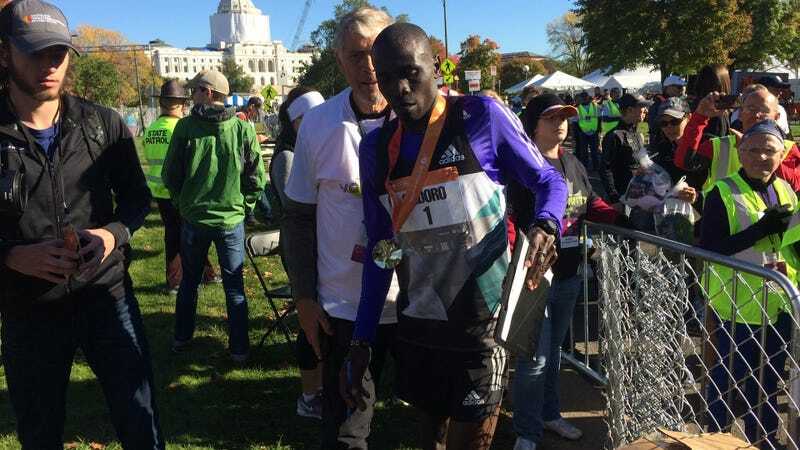 Ondoro ran a brilliant, gutsy race, and in becoming the new Twin Cities course record holder, he supplants Phil Coppess, whose 1985 unassisted handling of the route in 2:10.05 stood for 31 years. Thirty-one years. And that’s not for lack of trying. Thirty-one years of professional runners, guys who do this for a living, could not do what Coppess had done because it was extraordinary. It still is—as of last year it was the 18th best U.S. marathon in history—and always will be when you know the back story. I interviewed Coppess in 2012 for the New York Times. Unlike the vast majority of competitive U.S. runners, Coppess, who grew up in tiny Oxford Junction, Iowa, did not go to college. He moved directly into adulthood, getting married, having kids, and working rotating shifts at a corn processing plant. Running was a high school memory. Some years later, he noticed office workers at a nuclear plant running on their lunch hour and thought, I used to do that. Running at any level is not popular amongst factory workers, now or then: Coppess didn’t receive much support for his hobby. He eventually designed a training regimen that dovetailed with his rotating shifts at Clinton Corn and his parenting responsibilities; he was awarded full custody of his three children in a 1985 divorce. He ran 14 to 15 miles on work days, longer on his days off, carrying a bulky stopwatch to record each mile. “I didn’t think it was a good 20-miler unless I had gone under two hours,” he said. One day a week, he did a track workout, and on another, hills. Physical therapy consisted of weekly chiropractic adjustments. His parents helped out with child care, and he frequently brought his children along to the track and to races. “The kids knew the routine—I’d go for a run or they’d go with me to the track, then we’d go out to eat,” he told me in 2012. “I didn’t cook much.” He was apologetic about that. “I thought about Chicago and New York, but I was going for the win and thought Twin Cities was my best shot,” Coppess said. He took the weekend off and flew to Minneapolis. His parents made the five-and-a-half-hour drive with his three children. Coppess was confident that he could break 2:11, which he figured would be good enough for first place. As always, his strategy was simple: go out hard, a pace just under five minutes per mile, and keep it up for 26.2 miles. If others wanted to go with him, fine, and if they didn’t, that was fine, too. It was a brisk day, with temperatures at the start in the upper-30s. After six miles, he was alone in the lead. By the halfway point, he was out of sight from second place. That’s 26.2 miles the hard way, but he was accustomed to running alone. “It was a faster pace than I’d ever run for a marathon, but every mile, I was right where I wanted to be,” he said. Coppess passed the 30-kilometer mark in world-record time. He stayed overnight in Minneapolis because the hotel room was paid for, and because he did not have to work until Tuesday.